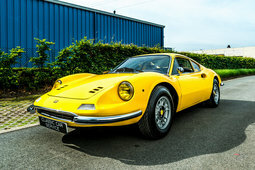 For Ferrari Dino project was the way to increase sales and reduce production costs. However, now it's design considered among Ferrari’s finest. Car's value climbing in recent years as the collectors learns how special it really is. Pininfarina came up with pretty, classic lines. The model met some critics as it was called not a ‘real’ Ferrari because of V6 engine. Dino cars were named after Enzo’s son Dino Ferrari who played a large role in the development of the V6 engine. How would the world react these days if manufactures such as, say, Lamborghini or Bugatti, decided to invest into the production of cheaper sports cars sold under a different name? You can be sure that such a move would be received with skepticism. Once upon a time, Enzo Ferrari’s decision to launch a new line of cars without using the Ferrari name got a similar reception. However, the founder and soul of the company had his arguments. At the time, Enzo Ferrari was feeling pressure from vendors to come up with a mid-engine model like the ones his competitors were making – Lamborghini, or Porsche, with its increasingly popular 911. He was nevertheless worried about the safety of his clients, fearing that they might not be able to handle a car with an engine mounted above the real axle. Moreover, he did not want to risk the Ferrari name, since less-expensive sports cars would have to be equipped with less-powerful engines. He therefore created a separate marque, and called it ‘Dino’ to honour his son Alfredino Ferrari, who died young but had contributed significantly to the development and improvement of the V6 engine. According to the original idea, it was precisely this motor, which thus far had only been used for Formula Two races, that was to be the heart of the Dino. At the same time, this was supposed to be the fundamental difference from other Ferrari models of that time, which exclusively used 12-cylinder engines. After several years of testing, the first Dino 206 GT came out in the middle of 1968, designed beautifully by Leonardo Fioravanti from Pininfarina. The new ‘baby’ from Maranello simply radiated Italian style – the car had a streamlined shape with no sharp angles, and the entire body was made of aluminum, so it weighed just 900 kg. The two-seater had a 2.0 L, 180 PS, V6 engine – the same used in the Fiat Dino, just 20 PS more powerful (Fiat and Ferrari had agreed on using a common engine and model name back in late 1964). The coupé could reach a speed of 235 km/h, and went from 0 to 100 km/h in less than 7 seconds. Incidentally, only 152 of these automobiles were produced the first year. In 1969, the model was already replaced by the 246 GT, which was equipped with a modified V6, 2.4 L, 195 PS engine, and a Spyder GTS version with a removable roof became available in 1971. In time, this proved to be the most successful Dino model, with more than 3,500 sold over five years. 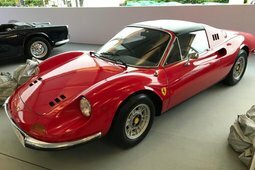 The Dino was sold in Ferrari showrooms, but its price was at least 5,000 dollars lower. However, compared with the Porsche 911, it was a somewhat more expensive model. For example, the asking price for a Dino 246 GT in the US was 14,000 dollars, while its rival from Porsche was 50 per cent cheaper. Buyers were also disheartened by the fact that the cars did not have the prancing horse logo. It was rumoured that American car dealers used to even put Ferrari stickers on Dino models on their own accord because it was the only way they could persuade customers to buy them. 1973 marked important changes in the history of the Dino and Ferrari as a company. 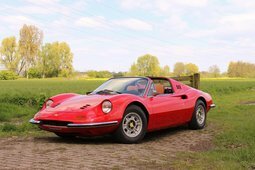 This was the year that the drastically updated Dino 308 GT4 2+2 made its debut. Bertone was entrusted with the design for this model (this was the first collaboration between the companies), and the classic streamlined form was replaced by sharp angles. The car might have seemed exotic, but it was definitely not Ferrari’s style. 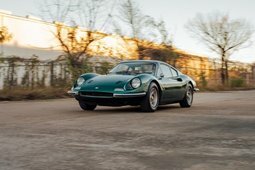 At the time, this decision was not greeted warmly, and many blamed the influence of the Fiat Group, which had acquired 50 per cent of Ferrari in 1969. It is clear that the Dino became a commercial project, but not a very successful one. It tried to combine sportiness with practicality: the wheelbase increased by 21 cm, and instead of two seats, it was now equipped with four. 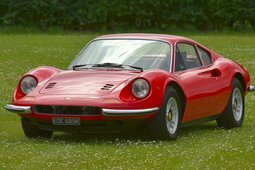 It is also interesting that the Dino 308 GT4 2+2 was Ferrari’s first car to have a V8 engine that produced 250 PS. The history of the Dino marque ended in 1976, when the hood, wheels and steering wheel of the 308 GT4 were embellished with the Ferrari logo. On the decision of the Fiat Group, this re-christened automobile was sold until 1980, since at the time it was taken as gospel that Ferrari had to have at least one affordable model in its range. It is estimated that Ferrari produced about 6,700 Dinos from 1968 to 1980. What are they valued at now? There was a time when no one needed the Dino – collectors didn’t appreciate them and claimed that a V6 cannot be the sign of a true Ferrari. However, trends show that in recent years, the prices for this car have gone up some 25 per cent and the average price is now upwards of 300,000 dollars. Granted, this is the price for a well-kept, first-generation Dino designed by Pininfarina. Later Dino models by Bertone aren’t as valued and go for 50,000-100,000 dollars. 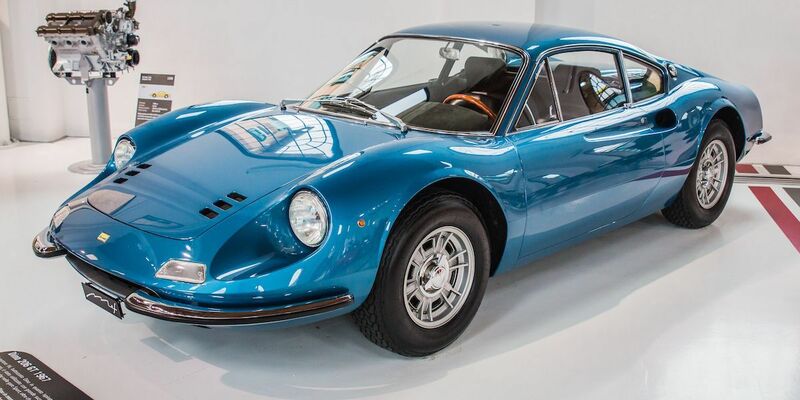 Although there has been repeated talk over the last decade that Ferrari will revive the Dino name and introduce a new model, for now the only way to have a Dino is to check out auctions or classic car ads. But have Dino prices reached their ceiling? Classic car experts doubt it. They predict that this exclusive model will be even more valued as an excellent alternative to traditional Ferraris and that their prices in the coming years will go up even more, to some half a million dollars.